Arcanine in game: 818 Who? Important notice! Pokemon Arcanine is a fictional character of humans. 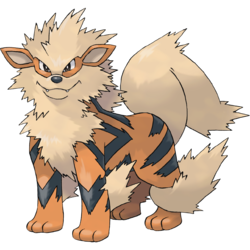 Arcanine is a quadruped, canine Pokémon with an orange pelt marked by jagged black stripes. It has diamond-shaped ears with beige insides, black eyes, a round, black nose, and two pointed teeth protruding from its upper jaw. Its head, muzzle, and chest are covered in shaggy, beige fur, except for two oval sections around each eye and ear. Long tufts of fur grow behind its knees and around its ankles. Its underside is black, and it has a billowing, beige tail that is bent in the middle. Each paw has three toes and a round, pink pad. 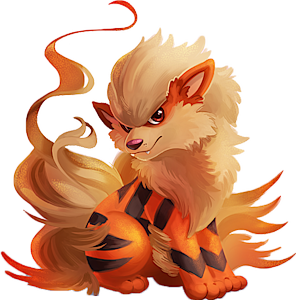 Arcanine is a fiercely brave and loyal Pokémon. It is capable of running 6,200 miles (10,000 kilometers) in 24 hours with a speed and grace reminiscent of flight. Additionally, the move Extreme Speed was its signature move in the past. Arcanine has long been admired for its beauty and speed, and anyone who hears its bark will grovel before it. The source of its power is a flame blazing wildly inside its body. In the anime, it was shown that it stashes food in its mane and carries it to its nest for its young. Arcanine lives on prairies, and Pokémon Snap has also shown it living in active volcanoes. Gary Oak has an Arcanine that was first seen in the episode The Battle of the Badge battling Giovanni. He used his Arcanine later to help him in the Extreme Pokémon Race in the episode Extreme Pokémon! against Ash's Bayleef. Arcanine and its pre-evolution, Growlithe, have often been used as police dogs. Ash battled an Arcanine in Fire and Ice. 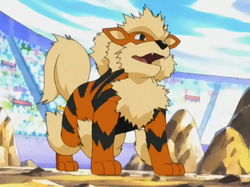 This Arcanine was under the ownership of Pete Pebbleman and was his final Pokémon. Despite the type disadvantage, Pete's Arcanine easily defeated Ash's Kingler by dodging its Bubble attack and using Dragon Rage. Pikachu managed to defeat the Arcanine with a Thunderbolt attack after its Fire Blast melted the Ice Field. In The Stolen Stones, two Trainers named Ramona and Keegan had three Arcanine, one under the ownership of Keegan and two belonging to his sister Ramona. The Fire-type Pokémon were used to deliver some Fire Stones to be used as prizes for a local Fire Pokémon tournament. The two Trainers used their Arcanine to save Ash, Misty, and Brock from falling off a cliff. In On Cloud Arcanine, Drew and May wanted to capture an Arcanine for use in a Pokémon Contest. When it was discovered that the Pokémon had a litter of Growlithepuppies to take care of, the two rivals decided to leave Arcanine alone. In Tactics Theatrics! !, Tucker uses the "Fiery Fleet-Footed" Arcanine along with a Swampert to battle against Ash's Swellow and Corphish. Marley owns an Arcanine, as seen in Keeping In Top Forme!. 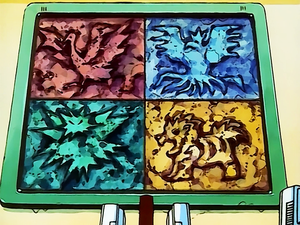 In Pokémon Emergency!, Arcanine was one of the four legendary Pokémon on the tablet at the Viridian City Pokémon Center. Despite not actually being a Legendary Pokémon, this may reflect its species description as the "Legendary" Pokémon. 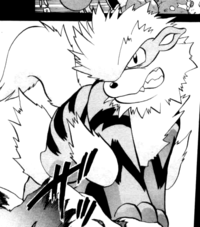 An Arcanine was seen in a fantasy in The Rivalry Revival. An Arcanine participated in a Pokémon breeding competition in Beauty and the Breeder. In Extreme Pokémon!, an Arcanine appeared with its Trainer in a field by Eggseter. An Arcanine along with a Growlithe were acting as security guards for a penthouse in Training Daze. Multiple Arcanine appeared in the opening of Destiny Deoxys. In Arriving in Style!, a Pokémon Stylist's Arcanine participated in the Hearthome Collection. 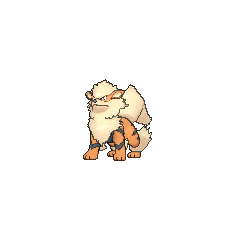 Arcanine appeared in File 4: Charizard where Blue used it to battle Red at the Pokémon League. An Arcanine appeared under the ownership of an International Police SWAT team in The Chase. An Arcanine owned by Evan appeared in Putting It on the Line...Against Arcanine where it helped in training Blaine's Mewtwo by setting the rocks thrown by the trainer's Haunter on fire. In Rock, Paper...Scizor, Blue captures a wild Arcanine that he adds to his Gym team and trains to the point of being able to defeat any challenger without its Trainer present. Crystal has an Arcanine, nicknamed Archy, which first appeared in Slugging It Out with Slugma and which she uses for transportation at times. He is able to hit targets fast and hard using Extreme Speed. As explained in a flashback in Lively Larvitar, Arcanine was a wild Pokémon from Mt. Mortar whose left eye was injured five years before. The cause is revealed to be a Larvitar prankster, which Crystal later manages to capture, regaining the confidence that was ruined by her failed capture of Suicune. In The Last Battle XIII an Arcanine was one of the Pokémon sent to help during the fight in Ilex Forest. Marley has an Arcanine that was first seen battling against Buck's Claydol in Leaping Past Lopunny. Though Arcanine is not a Legendary Pokémon, it was seen in an engraving along with Legendary Pokémon Moltres, Articuno, and Zapdos in Pokémon Emergency!.